Tracking employee time through the use of a time clock is a timeless practice. But the ability to accurately track employee time to the minute makes all the difference as it can literally amount to thousands in additional labor dollars, overtime and payroll taxes each year for employers. Time clocks have evolved enormously over the less 10 years technologically… and perhaps even over the last two years. But tracking time is not always as simple as it sounds. Some environments and workforces are far more challenging than others. With today’s web-enabled technologies around us, typically some basic resources are needed to fully benefit from today’s automation, such as a power source and/or internet connection. While that’s not an absolute, for environments without these general resources, specific technologies are available to help employers track hours. Let’s review what those time tracking options are relative to automated time and attendance solutions. Today’s workforce is more dynamic and mobile than ever. The notion of 9 to 5 from a central company location is giving way to remote workforces and a generation of work-from-home professionals. Clearly, technology is facilitating this evolution. Whether your workforce is partially mobile, off-site, or some combination in between, there are options to track employee hours efficiently. 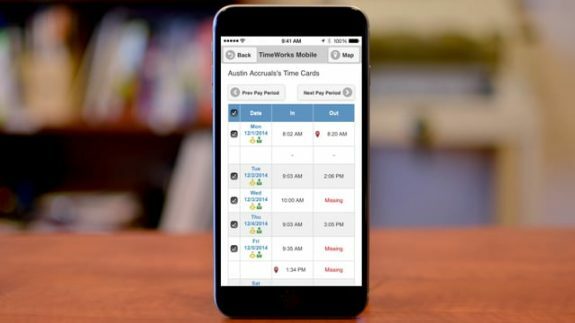 Mobile Timesheet App – Perhaps the most common solution for mobile and remote workforces is a mobile timesheet app. Employees can record hours from their smartphone, even when a cell/Wi-Fi connection is not available. The punches can then be reported as soon as a connection is established. Through GPS pinpoint punch stamps, you can verify employees are where they are supposed to be as punches are recorded. Another useful option with the mobile app is the ability for supervisors to clock in a group of employees at once, such as a construction crew. Browser-based Web Clock – If a traditional time clock is not available but a web browser is, your staff can easily record punches through any typical web browser. This can be both desktop or mobile-based. Telephone-based Time Clock – Another mobile option to record punches is a hosted Voice Clock solution that allows employees to call in to record punches. Punches can even be restricted based on the caller’s phone number to minimize misuse of this method. Technology has changed how and what types of services we enjoy every day from vendors. While there is a tradeoff to employing a remote or mobile workforce compared to the traditional, technology has allowed employers to continue to track employee productivity remotely while gaining new benefits and the ability to deliver new services like never before. If your workforce, however, is on site and more traditional there are numerous options available. Proximity Badge Clock or Key Fob – Another economical and common choice of time clock is the proximity badge clock. Employees can clock in simply by waving their prox card or a key fob, which is often as simple as waving a key chain or wallet across the time clock as the employee arrives for work. Hand Geometry Biometric Clock – For environments that are more challenging where a biometric finger scan is not feasible due to grease or dirt, another common solution is a biometric hand geometry time clock. This clock measures the size and shape of an employee’s hand to recognize the employee and record the punch. Common examples for this application include dish washing crews, mechanical services, landscaping, nursery and garden, etc. PIN or Badge Card – If a simple, inexpensive time clock is all you need, perhaps a basic time clock that only requires an employee PIN or badge swipe is for you. Although the cost to use a proximity badge or biometric solution is comparable, perhaps this basic method is your preference. While there are countless environments and logistical challenges to consider for employers, accessibility to time tracking technology should be available in most cases. You may be surprised at the types of applications that are made a reality every day. If you have a unique work environment and have questions about accurately tracking employee time, contact us at 941 Timekeeping.